Are you a keen camper, caravanner or motorhome adventurer? 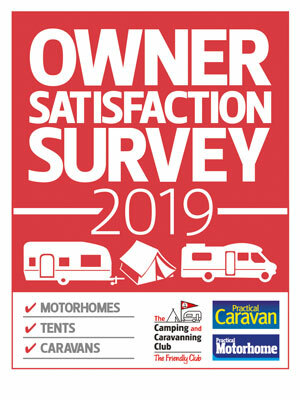 If so we would love to hear from you in the 2019 Owner’s Satisfaction Survey, run by The Camping & Caravanning Club, Practical Caravan and Practical Motorhome. Head on over to the Club website and carry out the survey most relevant to you. Your opinion matters to us and we love to hear your feedback on your kit as it helps us with future developments, allowing us to meet your camping, caravanning and motorhome needs! To thank you for completing the survey, The Camping & Caravanning Club will automatically enter you into their prize draw for a chance to win a week's free camping on a Club Site of your choice and a ton of prizes. Have your say click the image to take you to the survey.